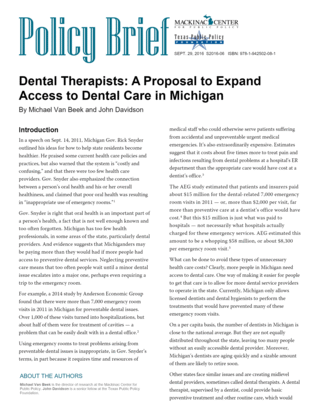 But even if dental costs were reduced in Michigan, there still might be underserved areas and populations. The U.S. Department of Health and Human Services defines and identifies “health professional shortage areas” throughout the United States. A shortage area can cover a segment of the population, a geographic region or even a specific health facility. Public officials identify HPSAs for medical physicians, dentists and mental health providers. A dental HPSA is designated based on the ratio of full-time dentists to the population. For instance, a geographical dental HPSA is one in which there are more than 5,000 people per full-time dentist. According to HHS, Michigan had 212 dental shortage areas in 2014. Although there was only one geographic dental HPSA — the rest were facility-based or special population-based — 76 of Michigan’s 83 counties had at least one shortage area. There are almost 900,000 people living in Michigan’s dental HPSAs, and only 42 percent of the needed dental services are being provided in these areas, facilities or to these special populations. Michigan would need another 128 full-time dentists working in these facilities and serving these populations to eliminate all these shortage areas. Federal agencies also rank the severity of shortage areas, allowing for a prioritization of alleviating the 212 different needs. In Michigan, the highest priority dental HPSAs are in the following counties: Houghton, Baraga, Dickinson, Ionia, Wayne, Chippewa, Clare, Mecosta, Osceola, Alger, Grand Traverse, Isabella, Montmorency and Tuscola. The more rural areas of Michigan — the northern Lower Peninsula and entire Upper Peninsula — are home to the most shortage areas. The more populated and suburban areas in the southern Lower Peninsula have fewer dental HPSAs. Providing dental services to sparsely populated geographic regions appears to be to be a challenge in Michigan. The impact of these shortage areas on the oral health of Michigan residents can be found in surveys and screenings of population groups in Michigan. For instance, in a 2010 screening 17 percent of third-graders in Detroit needed immediate dental services, while only 7 percent of third-graders statewide did. Likewise, while 27 percent of third-graders statewide had untreated dental disease, 42 percent of Detroit third-graders did. Also, while 51 percent of third-graders in the state had had a cavity in their primary teeth, 63 percent had in the Upper Peninsula. But, somewhat surprisingly, third-graders in the Upper Peninsula were more likely to have seen a dentist within the last year than most other children around the state. While 91 percent of them made a visit, while only 74 percent of third-graders in the northern Lower Peninsula did. New midlevel providers like dental therapists may help alleviate these shortages. Dentists could supervise dental therapists and use them to expand their network of care. They also could deploy them to high-need areas and do so for less money than opening up a brand new office and hiring more dentists.